I've already completed a pair of Halloween-ish games in recent weeks: Creeping Terror for 3DS and Undertale for Switch. They'll soon be joined by the following sextet of spooktacular titles, all of which I hope to play between now and All Hallows' Eve. I can't promise I'll finish all of the games discussed below, mind you. I will start them, though, and then put as much time into them as I can before the calendar flips over to November. 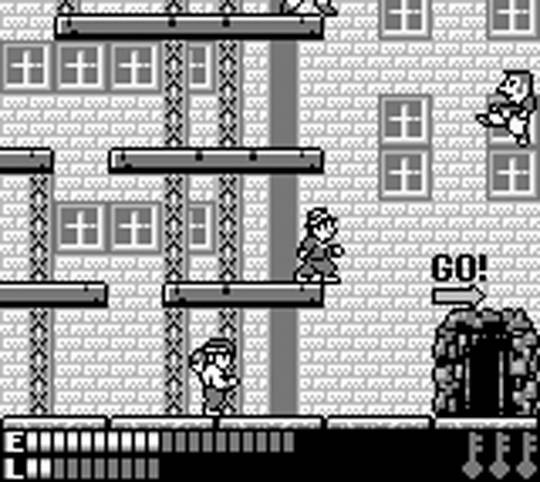 Avenging Spirit (GameBoy)--If you're a bit of a Japanophile like I am, you may know this game as Phantasm rather than Avenging Spirit. You also probably know it's fairly well regarded by people who've played either version. That makes a lot of sense once you're clued in to its premise. A group of mobsters kidnap your girlfriend and then kill you. Now you're a ghost. A ghost that can possess other people. Make use of that unfortunately acquired skill to track down your lover and take revenge on the thugs who took your life. It's all quite thrilling--or at least that's how I'd describe the few minutes I've put into Avenging Spirit here and there--if not entirely "seasonally appropriate." Death Mark (Switch)--I first became aware of this horror-themed visual novel when it was released (in Japan) for the Vita last summer. At the time, I didn't even know what kind of game it was--all I cared about was its stunning box art. So when the news broke a few months ago that a localized version of Death Mark would hit Western store shelves in time for Halloween, I almost fainted. Sadly, publisher Aksys Games switched out the Japanese release's cover illustration for one that's a bit more "by the numbers." Oh, well, I'm still excited to see how it compares to the other VNs I've played so far. Dark Souls Remastered (Switch)--I thought I knew what I was getting myself into when I fired up this game's network test a couple of weekends ago. Boy, was I wrong. Not that I'm complaining; I actually enjoyed it--even if I did die innumerable times, and even if I did find it sort of suffocating. I will admit that this bite-sized portion of Dark Souls Remastered stumped me now and then, but I figured things out eventually thanks to a bit of internet sleuthing. Something else I'll admit: I'm still not sure this is my kind of game. I'm going to give it a go anyway, though, because I'd rather try it and hate it than ignore it and wonder "what if?" Luigi's Mansion (3DS)--The original Luigi's Mansion is another one of those games that I've "always meant to play." Or maybe I should say I've always meant to play it for more than 30 minutes or so--because that's about the longest I've spent with it to date. I blame that appalling lack of attention on my nearly decade-long disinterest in playing games while tethered to a TV. This 3DS port of the game should solve at least part of that problem. Hopefully it'll solve the other part, too; in other words, hopefully I'll actually finish it this time around. Magical Chase (PC Engine)--What I'm about to say may shock some of you: I've never been the biggest fan of this Quest-made shoot 'em up from 1991. Admittedly, it's likely my feelings on the game have been colored by the astronomical prices that tend to be attached to copies these days. That's not all of it, though. I'm also not too keen on what I see as Magical Chase's discordant theme. I mean, your "ship" is a broom-riding witch--why do you fly it through bright and colorful environments that look nothing like the creepy locales typically associated with such beings? Still, as much as I wish it were a little more like Cotton, I can appreciate its designers' attempts at creating something different. I'll try to remember that during this latest playthrough. Super Mario Land 2 (GameBoy)--OK, so Super Mario Land 2 isn't exactly a Halloween-esque game through and through. It does feature a "zone" that fits the season at hand, though--or so I've been told. I can't say so myself, because I'm a Super Mario Land 2 virgin. (Gasp!) Of course, this isn't the first time I've suggested I was going to start my way through this title, though it will be my last. Why? Because I've already bought it (via the 3DS eShop). Here's hoping it's only a matter of time before I reach the "Pumpkin Zone" alluded to earlier. Are you planning--or hoping--to play any spooky or scary games in the lead-up to October 31? If so, which ones?